Video Highlights: Letran survives EAC 76-72 (NCAA Season 92 - June 28, 2016) - Balita Boss! 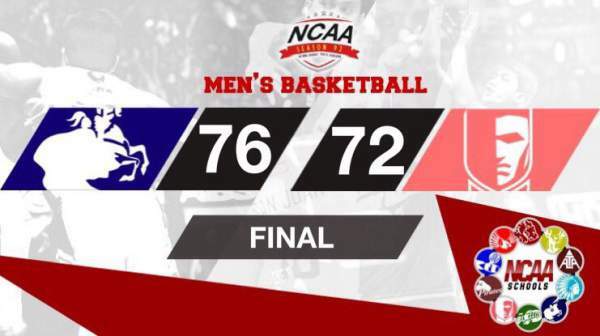 The Colegio de San Juan De Letran Knights survived a huge scare from the Emilio Aguinaldo College (EAC) Generals for a 76-72 win in the NCAA 92 Senior Men’s Basketball Tournament. Veteran guard Rey Nambatac scored a career-high 33 points and had five rebounds and two assists for Letran Knights. Bong Quinto added 17 points, three rebounds, two assists and three steals. For the Generals, Cameroonian Hamadou Laminou finished with double-double 23 points and 18 rebounds. Igee King and Francis Munsayac added 14 markers each. LETRAN 76 - Nambatac 33, Quinto 17, Balanza 7, Sollano 6, Apreku 4, Calvo 4, Balagasay 2, Luib 2, Dela Pena, Ambohootn0, Bernabe 0, Sario 0, Vacaro 0. EAC 72 - Hamadou 23, King 14, Munsayac 14, Morada 10, Onwubere 4, Pascua 3, Corilla 2, Diego 2, Aguas 0, Estacio 0, Guzman 0, Mendoza 0, Neri 0, Serrano 0.